Marian Pierre-Louis wrote an interesting blog post Bibliographies are So Not Boring on her Roots and Rambles blog. I confess it made me think about Bibliographies in an entirely new way. For I am a Footnote geek. Yes, I love footnotes. I'm guessing that I'm in the 3% of the population who actually reads them! I skim Bibliographies and often skip them entirely. But which is best - Footnotes or Bibliographies? For the purpose of comparing Footnotes to Bibliographies, let's look at the definitions provided at the Merriam-Webster dictionary. When writing a scholarly article or book, authors often use footnotes which contain exact citations of the sources used for each specific statement. The genealogy articles that I've had published in the New York Biographical and Genealogical Record are footnoted. That is what the NYGBR insists on. Each footnote must follow an exact standard method of writing footnotes and it is very exacting. My genealogy-history books are always footnoted. Occassionaly I provide a bibliography but it never replaces footnotes. So I'm a bit of a footnote snob! The first thing I look for in a scholarly book is footnotes. Preferably several on each page. Numbered footnotes can either be placed at the end of each page, or inserted without a number in the body of the text. I prefer at the end as I find it distracting and often confusing to keep reading an interjected footnote. For me it's like having someone interrupting a conversation I'm enjoying. I'd rather read the footnotes when I finish the page or the sentence or the paragraph. That way the writing is more cohesive. I confess to having skipped over Bibliographies in the past. But Marian's article has me thinking and I can see the value in adding a Bibliography to my future books and articles. It seems to me that the footnote does it's thing by citing the source used for that specific piece of evidence or statement made by the author. And that's what I want to see! But I now realize that the footnote is only part of the final product. As an author, I consult many reference books in my research. I probably did not cite them in my footnotes as they were more of a generic research and not related to any specific fact. For example I always research the history of the location or time period which I am writing about. If I don't create a Bibliography, the reader will never know what books or articles I found and consulted which may be of great interest to him or her. It's Movie Monday - the late feature is showing today. YouTube - OliveTreeGenealogy's Channel has Video 2 of Waubaushene Protestant Cemetery in Waubaushene Ontario online as a Cemetery Walk. There are more Cemetery Walks and Ships Passenger Lists online on OliveTreeGenealogy's Channel so be sure to drop by and have a peek. 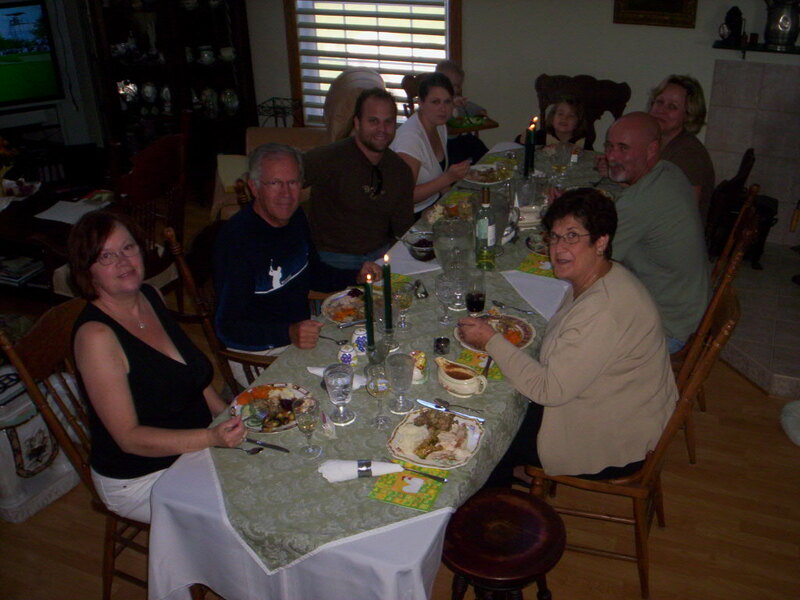 Today is the American Thanksgiving. We Canadians already celebrated ours but I'm wishing all my American readers a very happy day with family and friends. It seemed like a good day to post a couple of pictures of Thanksgiving Dinners we've had over the years. Happy Thanksgiving to all who celebrate it today! The European Origins of the Boelen Family: Boele Roeloffson and His Wife Bayken Arents in Amsterdam by Lorine McGinnis Schulze was published in the April 2000 issue of The New York Genealogical and Biographical Record. The article was an overview of genealogy records found in Amsterdam for Boele and Bayken. After the article was published, more research was conducted with exciting results. Bayken Arents’ father was found to have used a second patronymic. In-depth research provided more family details and genealogy records recorded under this second patronymic. In order to share this exciting new information a book was developed: New Netherland Settlers. Boele Roeloffsen & His Wife Bayken Arents From Amsterdam with information on the European Origins of the Family by Lorine McGinnis Schulze. The book is set in the historical context of the early Dutch settlement in New Netherland (now New York). The history of New Netherland, customs, religious practices, and settlement of Fort Orange (Albany) are discussed in depth. An explanation of the patronymic system of naming, the barter system of paying for goods and the English translation of common Dutch words used in church records is provided. Boele and Bayken's origins in the Netherlands are thoroughly covered with Bayken's newly discovered lineage documented and sourced in footnotes. A genealogy report for Boele and Bayken and their children as well as Bayken's ancestry are clearly laid out. Hand-drawn maps complete this book which is part of the New Netherland Settlers series. Publication: New Netherland Settlers. Boele Roeloffsen & His Wife Bayken Arents From Amsterdam with information on the European Origins of the Family. It's Movie Monday and time for popcorn and soda pop! Today's featured movie is a cemetery walk through Waubaushene Protestant Cemetery. The Cemetery is in Tay Township, Simcoe County Ontario. This is Video 1 (20 photos) and Video 2 (another 20 photos) will be uploaded this week. You can find more Cemetery Walks and Ships Passenger Lists on Olive Tree Genealogy Channel on YouTube. Be sure to SUBSCRIBE to the channel for updates. I have so many daredevils and unusual or outlandish characters in my lines I'm not sure where to start or who to pick. I've already talked about a cousin Stephen Peer, the tightrope walker who has the dubious distinction of being the only tightrope walker to die walking the rope at Niagara Falls. I've bent my readers' ears in two blog posts about my cousin Harmon Peer, first ever bungie jumper in North America! Who to choose? There is always my 9th great grandfather Albert Andriessen de Noorman (whose children assumed the surname Bradt and Vanderzee) who was arrested many times in New Netherland (now New York) in the 17th century for various offenses. In fact in 1638 a letter from Van Rensselaer (the Patroon of the Colony) was sent to Albert in which Van Rensselaer stated that he had heard that Albert was "very unmerciful to his children and very cruel" to his wife, and that this should cease immediately. Threatening the neighbours and setting fires brought Albert to court repeatedly, and in exasperation the courts ruled that Albert's sons must watch him and ensure that he did not bother people anymore. Or perhaps I should talk about my rather free spirited ancestress Anna Kuhn of Germany. Anna, my 8th great grandmother, was born about 1659, and at the age of 15, she was married to Jorg Bruning at Huttengesas, Germany. Jorg Bruning was an older man, and the marriage was a most unhappy one for Anna . While living at Huttengesas with her husband, she fell in love with Nicholaus Bellinger. Still married to Jorg, Anna ran away with Nicholaus and had a son (my direct ancestor), Marcus Bellinger, in 1682. "Nicolaus Bellinger and Anna, daughter of Hans Kuhn, were married 25 Nov. 1685 as per the order of the noble government. She had married some years ago Jorg Bruning at Huttengesab, but she was not compatable with him, so Bruning went from her and she from him. She went away with this Nicolaus Bellinger and had an illegitimate child - a little son, so that the aforementioned Jorg Bruning has contracted another marriage. After all this however, the above mentioned Bellinger has remained as a stranger. She sent a request to the honourable government to let them stay in the country, and this finally has been permitted by the aforementioned honourable government which ordered me to marry them with prior published penitence and to avoid further trouble and also to legitimize the rearing of this blameless child"
I think I've run out of room to write about any of my other interesting, intriguing or n'er-do-well ancestors for today! The following press release looks quite interesting. The column headings are often missing or difficult to read. Library and Archives Canada is pleased to announce the launch of new tools to facilitate the consultation and use of its immigration records, one of the largest and most consulted by genealogists. Transcriptions of headings of different forms used to record the names of immigrants arriving in Canada between 1865 and 1935 are now accessible on the Library and Archives Canada website. Links to different databases and websites offering nominal indexes or digitized images of immigration records have been regrouped on a single web page. Toronto, ON (November 18, 2010) – Ancestry.ca is proud to have been recently announced as a finalist for the prestigious 2010 Pierre Berton Award, presented for excellence in contributing to the study of Canadian history. Ancestry.ca, Canada’s leading family history website, offers Canadian families the opportunity to explore their family – and national – history with the click of a mouse. “Ancestry.ca is thrilled that we were considered for the 2010 Pierre Berton Award, and humbled to be among such exceptional company,” said Ancestry.ca Managing Director Karen Peterson. Established in 1994 by Canada's National History Society, the Pierre Berton Award celebrates individuals and organizations who work to expose Canadian history to a wider audience, and engage Canadians with their historical roots. Since its inception the Award has become a top mark of distinction for those who seek to bring Canadian history into the everyday lives of Canadians. Ancestry.ca is proud to be among such notable award nominees as freelance journalist Dan Francis and filmmaker Bernard Zukerman, as well as this year’s winner Professor Desmond Morton and last year’s recipient actor Paul Gross. Even though it is Wednesday, here is Monday's Movie! The second and last video of Genier Cemetery near Cochrane Ontario is now online and can be viewed. Thanks to Jim Rye for contributing the Genier Cemetery photographs. Please share this information with other genealogists. The following Press Release was just received. Sounds intriguing! Ancestry.com is pleased to announce it has created a strategic alliance with National Geographic Digital Media to help individuals make new discoveries in their family history. As part of the relationship, NationalGeographic.com will host a family history experience online, developed by Ancestry.com, which enables visitors to learn more about researching their genealogy and provides specific tools for them to search their ancestral roots located on the Genographic Project website. The new feature is an add-on to National Geographic’s existing Genographic Project Web portal that helps chart the migration history of the human species using DNA analysis. This additional online experience offers the ability to start an online family tree, tips on how to get started with researching family history and links to important historical record collections that are searchable on Ancestry.com. For anyone interested in learning more about their ancestors, or to experience the family history tools offered by Ancestry.com and National Geographic, visit https://genographic.nationalgeographic.com/genographic/lan/en/genealogy.html. 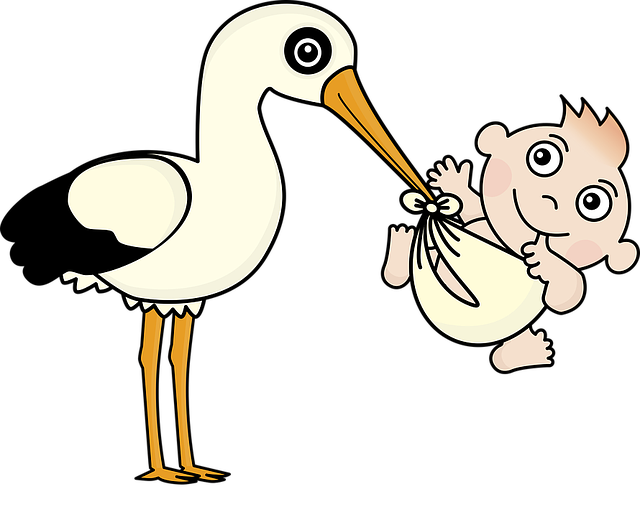 Have you ever wondered what happened the day you were born? What was going on in the world, what was the top news of the day? What was the average housewife buying? What about the guys - what ads were geared towards the typical male such as your father? Have you checked newspapers for your town or city or country to read the front page for that day? I couldn't find a newspaper for the little village my parents lived in but I did find one for a nearby town so on a binge of curiousity I had a peek. Of course a local small town paper wouldn't likely show worldwide news unless it was a pretty big story but I thought I'd get a sense of what my parents and grandparents might have been experiencing. So the big world news on the day and year I was born was a 4-row corn picker in Illinois - apparently a first ever. Locally the news was a mixture - an annual St. George's Guild bazaar coming up, the fact that not many people turned up for the local Remembrance Day Ceremonies, and that deer hunting was not going well. 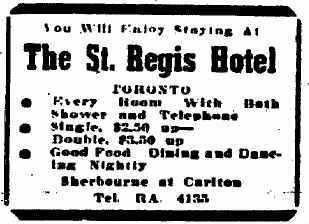 I did enjoy reading that the St. Regis Hotel in Toronto (the closest big city to my little village of birth) had rooms to rent starting at $2.50 for a single, per night. Oh and every room was advertised as having a telephone and a shower. I began to feel like I was born in 1900! Were things really that cheap the year I was born? Phillips Milk of Magnesia was 25 cents a bottle! One ad was for developing rolls of film for 25 cents - no digital cameras back then of course. And I loved the ad advising that you could buy a female ferret from a man in Ontario for $3.00 - send a money order. No paypal as we use today. There were a lot of ads for baby chicks and brooders so I'm guessing that a lot of families kept a hen or two for eggs. But my favourite ad was the one for an electric washing machine. Even though it will date me, it's too priceless to not show my readers. 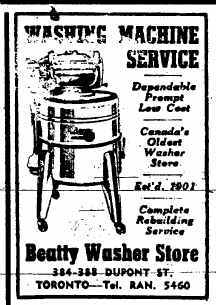 I actually remember helping my mom with the laundry and using a machine that looked just like this one! I wonder if my parents had been to the movies in Whitby before I was born? Whitby was nearby and their local theatre had three shows to choose from! "The Return of Frank James" which sounds like a Western, "Cinderella Jones" and "Do You Love Me" - none of which I've ever heard of. I googled "The Return of Frank James" and read that it came out in 1940! I assure you I wasn't born then, not even close, so that might indicate that our little village and surrounding areas were getting the movies many years after they were made! "Cinderella Jones" and "Do You Love Me" were made in 1946 so that's a little more current. We didn't have much money so I'm not sure they could even have afforded to go but I'd like to think they did. It was kind of fun reading that newspaper from the day I was born. And now I'm off to find out what today has in store for me. Reserving time for my nap of course, as us old folks like to have. Discover your origins in letters as ancestors tell their stories and reveal family relationships, past events, moments in time and details of family history. 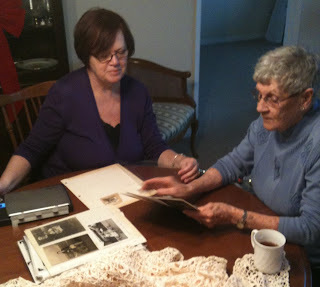 Find your ancestors through their own letters sent to loved ones far from home. Past Voices gives our ancestors a voice - and these voices from the past come alive in their letters. Many letters on Past Voices are from soldiers far from home. Nothing tells the true reality of war more than the simple writings of the common soldier. These poignant letters from lonely men to their mothers, wives or sweethearts will touch your heart. Some letters will leave you bewildered by their unemotional telling of horrors almost beyond our comprehension. 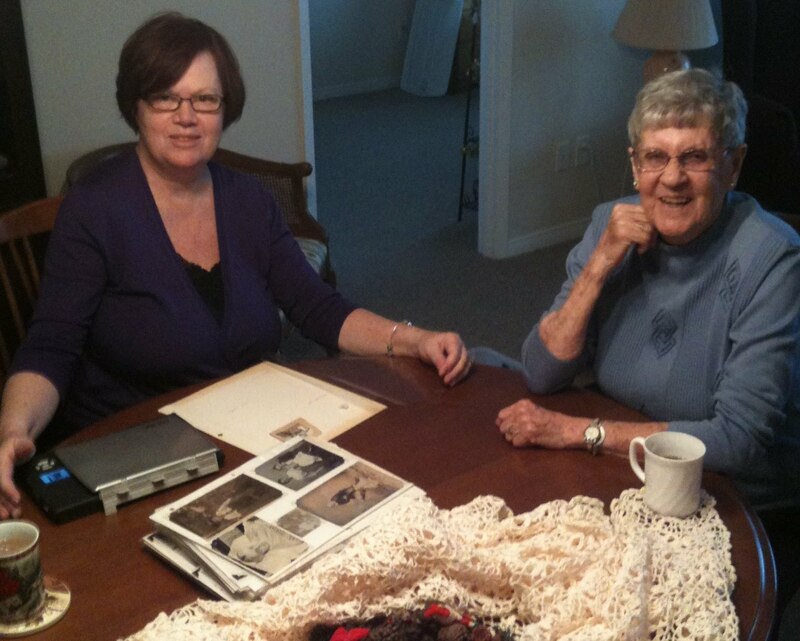 Past Voices also contains letters and memoirs from ordinary individuals going about their everyday lives. These letters provide us with a sense of history, of being there and experiencing life with the people who write about the times they live in. The following press release came from Ancestry.com Personally I can't wait to find my grandmother and her parents in Kent England in 1911! Provo, Utah, November 5, 2010 – Ancestry.com , in collaboration with UK Web site Thegenealogist.co.uk, is pleased to announce that an agreement has been reached with The National Archives to acquire and publish online the 1911 England and Wales Census. The two family history companies will work together to transcribe the 1911 Census, creating a searchable database which enables users to type in a name and go directly to the full color digital image of the actual census document, handwritten in their ancestor’s home a century ago. The complete set of 1911 Census records go live on Ancestry.com by county, starting in late 2010 and completing in 2011. Part of the archival holdings of The National Archives, the 1911 Census is the largest and most recent census available to the public . A crucial genealogical resource, it offers detailed insight into how people lived in the years leading up the First World War, showing who lived where, with whom, their age at the time of the census, their place of birth and what they did for a living. Today is Remembrance Day. It's also called Poppy Day or Armistice Day or Veterans Day. This is the day we honour those who have fought and died in wars since WW1. Many of us also honour our ancestors who participated in other wars. 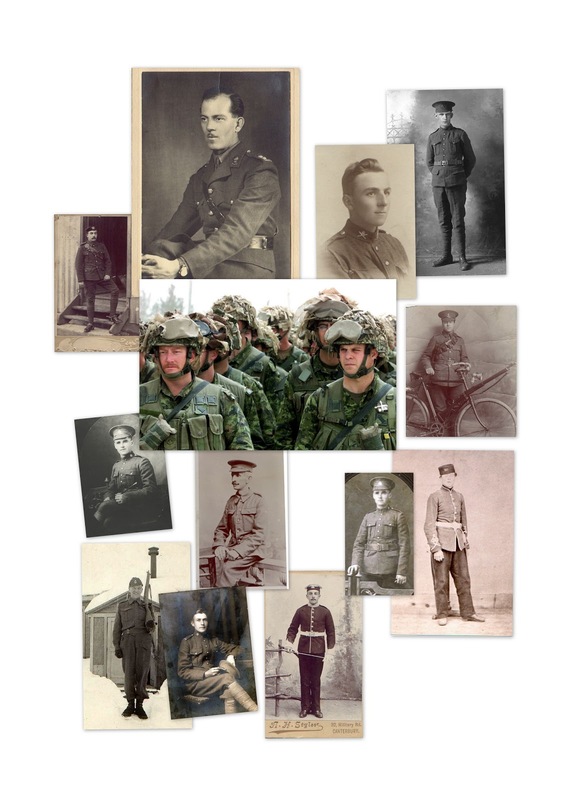 Do you have some military heroes in your family tree? My definition of a military hero is anyone who fought or participated in any way on behalf of my country, in any war. My son who has been to Afghanistan five times in eight years. My grandmother McGinnis' five brothers (George, Herbert, Chester, Leonard and Edgar Peer), all of whom enlisted in WW1. Edgar Peer was killed in France a few days short of his 21st birthday. My grandmother Fuller's two brothers Ernest and Sydney Simpson who enlisted in WW1 in England and in Canada, and her brother Albert who enlisted in the Australian Army in WW2. I cannot imagine the sacrifices made by all of these heroes in my family. But I appreciate them all and honour them today. PROVO, UTAH, November 10, 2010 - Ancestry.com , which has the largest online collection of historical military records, today added more than 115,000 U.S. Military Academy Cadet Application Papers from West Point to its online collection of military records to commemorate Veterans Day. · Thomas J (Stonewall) Jackson (1842) – one of the most well-known Confederate commanders, eighteen-year-old Stonewall Jackson was the subject of a nomination letter for West Point from South Carolina Governor F. W. Pickens. In his letter, Pickens asks if there are any vacancies at West Point for the state of South Carolina, and requests a copy of the department rules and qualifications for admission. Jackson went on to graduate 17th out of 59 students in the Class of 1846. · George A Custer (1856) – most remembered for a disastrous military engagement at the Battle of the Little Bighorn, Custer’s nomination letter describes him as “17, 5’ 9¾”, good health, no deformity, reads well, spells correctly, writes a fair and legible hand, able to perform with facility and accuracy the ground rules of arithmetic, fully possesses all the qualifications physical, mental, and moral required.” This nomination letter sent to Jefferson Davis was written and signed by Congressman John A. Bingham, the judge advocate in the trial of Abraham Lincoln’s assassination and a principle framer of the 14th amendment. Custer went on to graduate last in his class at West Point. The collection includes many other records and letters relating to artist James Whistler, Dupont dynasty heir and Civil War veteran Henry Dupont, and Union Army Major General George B. McClellan. The West Point Cadet Application Papers are part of Ancestry.com U.S. Military Collection, which includes 100 million names that span more than three centuries of American military service. In honor of America’s military heroes, the entire U.S. Military Collection on Ancestry.com can be searched free from Veteran’s Day through Nov. 14. Crime and Punishment in Upper Canada: A Researcher's Guide (Genealogist's Reference Shelf) by Janice Nickerson is a very detailed, well-researched reference book for genealogists. Janice delves into the history of the Justice System in Upper Canada (present day Ontario) and walks the reader through the often confusing maze of available records. Her focus in this book is 1791 to 1841 and even that seemingly brief time span provides the genealogist with 243 pages of material. Each section (topic) has a history and explanation, followed by examples both in text and images, and then Janice's inventory of what records have survived, where they are housed, and what we might expect to find in them. 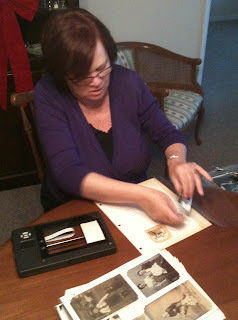 It is a challenge for genealogists to find early Ontario (Upper Canada) records and Janice's book is a treasure trove. The examples are fascinating reading for historians or those interested in the circumstances of various crimes and their meted out punishments. Case studies are of actual individuals whose court cases were heard or who were charged with crimes. The inventory list of resources made me drool! I am at a stage in my Ontario research where I need to find more obscure records - those that are challenging to discover. Janice's book has given me so many new leads and so many new avenues of research to investigate that I will be busy for quite some time. Crime and Punishment in Upper Canada: A Researcher's Guide (Genealogist's Reference Shelf) is a must-have for any serious genealogist or anyone struggling to find an ancestor in early Ontario. Jim Rye very kindly walked this cemetery, took photos and sent them to Olive Tree Genealogy for Movie Monday (thank you Jim!). The second video is not online yet but will be shortly. There are approximately 57 gravestones in this Cemetery. We also have some ships passenger lists so be sure to drop by for a visit. Bring your own popcorn though! If you want to be sure you don't miss one of our videos, you can SUBSCRIBE to the channel once you are at the YouTube page. Many if not all of us have encountered it. A long-ago ancestor whose name has suddenly appeared in an original marriage record but barely recognizable as your ancestor! I've talked about problems with name variations before - in The Name Game, parts 1 and 2 I shared how difficult it was finding my husband's great grandfather "Archie" DeMeulenaere in the records in Belgium. Why? Because his baptismal name was "Achiel" but we did not know this. In The Confusing Maze of Genealogy Mixups in Names you can see some common names in other countries and what they equate to in N. America, as well as the true story of my ancestor who changed his name from Van Valkenburg to Vollick after the American Revolution. But back to your dilemma of that marriage record for your 5th great-grandfather John Smith. Instead of seeing your ancestor recorded in his marriage record as John Smith (which you know is his name), he is listed as John Smythe. But you know it's the right person because his wife's name is correct. Hmm... You scratch your head in bewilderment and puzzle over how to enter this information in your genealogy program. Not sure, you move on to finding his arrival in the USA. And bingo there he is - you know it is him because he is with his siblings whose names you have proven. But his name on the passenger list is recorded as Johann Schmidt! What to do?? Other ancestor records are found - for your great grandmother Anna Maria Werner. But you find her in various records as Mary Warner, Anne or Anna Warner/Werner and even Hannah Warner/Werner. Not only do inviduals have nicknames (hubby's grandfather was born Leon Thomas as his first and middle name, but called Charlie his entire life) they sometimes switch between using their first name to their middle name, or vice versa. German naming conventions often use two names, with the middle name being the name the person is known by. Those of us with Dutch ancestors in early New York (New Netherland) are faced with another problem - patronymics, or identification of an individual based on the father's name. For example, Jan Albertszen is named after his father, Albert. Albertszen means son of a man named Albert. Geesjie Barentsdr. (Barentsdochter) is named after her father Barent. An individual could also be known by his place of origin. Cornelis Antoniszen, my 9th great- grandfather, was known in some records as 'van Breuckelen', meaning 'from Breuckelen' (a town in the Netherlands). The place-origin name could be a nationality, as in the case of Albert Andriessen from Norway, originator of the Bradt and Vanderzee families - he is entered in many early records as Albert Andriessen de Noorman, meaning the Norseman. An individual might be known by a personal characteristic: e.g. Vrooman means a pious or wise man;Krom means bent or crippled; De Witt means the white one. Sometimes an occupation became a surname. Smit=Smith; Schenck= cupbearer, Metsalaer= mason. An individual might be known by many different 'surnames' and entered in official records under these different names, making research difficult unless you're aware of the names in use. Phew! So, you've hit the name wall. You have found your ancestor under a dizzying and bewildering variety of recorded names. 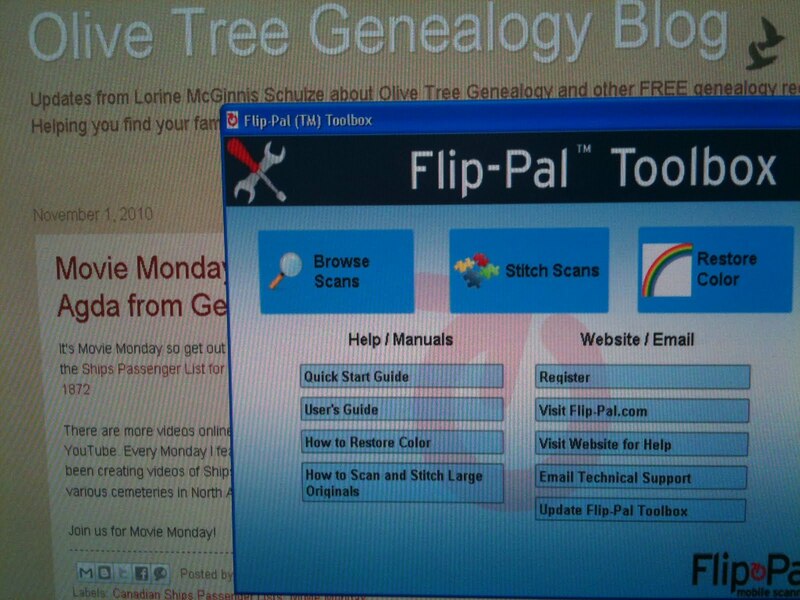 How do you enter this information in your genealogy program?? Consistency is very important. The best method is to choose ONE name - the name you knew your ancestor by if you knew them personally, or the name most often found in the genealogy records. Enter that name in your genealogy program and use it consistently. In the notes section you can note the other names under which you found your ancestor. In your sources, note exactly how the name was recorded. And now you're good to go, your genealogy is consistent and accurate. And you can enjoy thinking about all those names your great great grandfather used in his lifetime. Today's Featured Database is a project on ShipsListsOnline. ShipsListsOnline is transcribing ships passenger lists leaving USA, bound for Europe and United Kingdom. Many of these passenger lists were donated to ShipsListsOnline by Shelby Thompson from her personal collection. Others were submitted by visitors to Ships Lists Online . SAN FRANCISCO, Calif., November 4, 2010 – Ancestry.com today announced the launch of Family Tree Maker® for Mac , the new Mac version of the world’s No.-1 selling family history software. Family Tree Maker for Mac provides an easy way to save and organize your family tree conveniently on your Mac computer and has a variety of tools that can help you share your discoveries with family and friends. · Grow your family tree – Search Ancestry.com directly from Family Tree Maker and seamlessly merge historical records and important information you find into your tree. Family Tree Maker for Mac comes with either a free trial or subscription to Ancestry.com. · Organize photos and documents in one location – Add photos, documents, audio, video and other media files to the people in your tree to help make their stories even more fascinating. · Create family books, charts and reports – Publish beautiful keepsakes and books to share with friends and family. 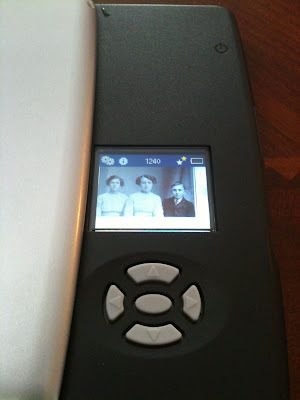 · Craft slideshows – Create slideshows from photos in your tree. · Cite the right information – Standard source templates make it easy. · Explore family migration paths – View timelines and interactive maps, highlighting events and places in your ancestors' lives. · Track information – Powerful sourcing tools let you document and rate each citation. Family Tree Maker for Mac is now available for purchase online at starting at $69.99. The program is also available in select retail stores, including Apple Stores, Amazon, Office Depot, and Office Max. Family Tree Maker for Mac is built on the functionality of Family Tree Maker 2010, the PC-version of the software, and is constructed from the bottom up to take full advantage of the Mac platform in terms of technology and user experience. My Flip-Pal Mobile Scanner arrived yesterday. So today I gave it a test run. Let me jump to the end before I give you details -- I LOVE IT! It was well packaged for its long journey to me in Canada. I was impressed with how lightweight it is and yet it looks solid and well-made, nothing flimsy looking about this scanner at all. The instructions are on a little fold-out card and very simple and easy to follow. 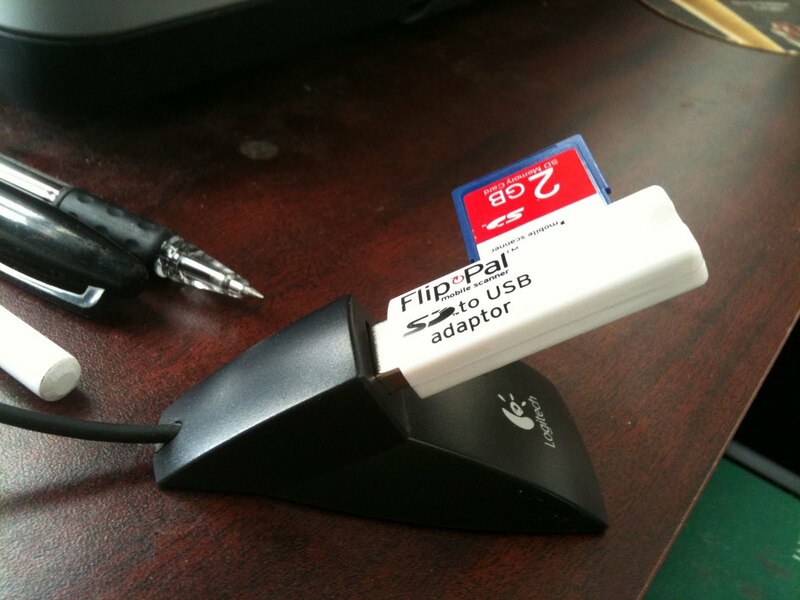 It comes with a USB Adaptor for moving your scans from the Memory Stick (just like the one your digital camera has) to your computer - in case you haven't got a Memory Stick slot. 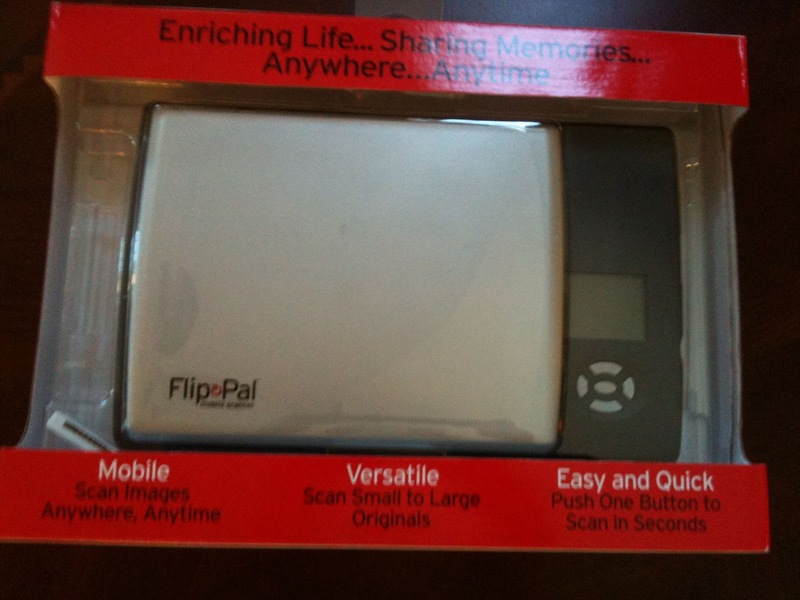 When you first turn the Flip-Pal Scanner on (it comes with batteries installed, how nice is that! ), the Viewing Window walks you through setting the date and time. Simple. And yes, the Viewing Window is of neccesity small but even I with my very bad eyesight, can see the words and pictures just fine. I grabbed an assortment of old family photos just to give the Scanner a test run. It was super easy to set a photo on the scanning window and then push the green button on the side. Bingo - done! 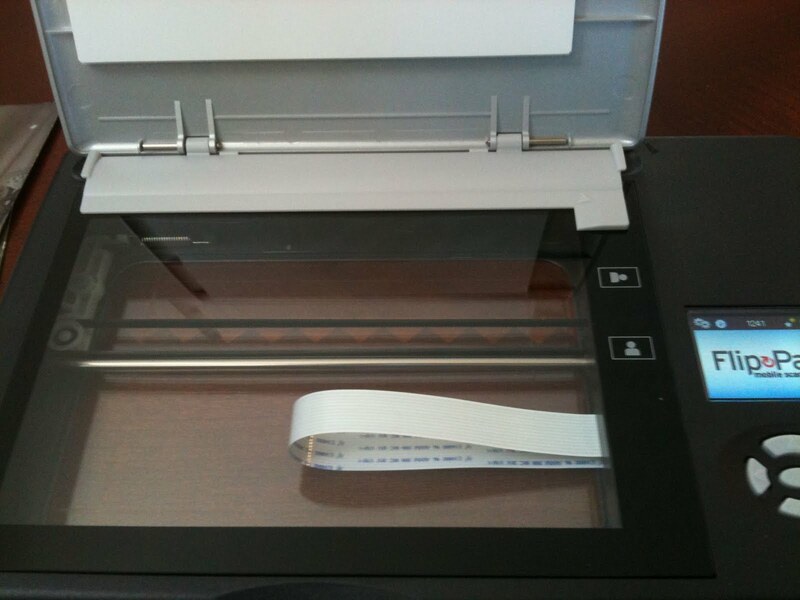 Your scanned photo appears in the viewing window so you can make sure you've got what you want. Then you simply insert a new photo and push that green button again. The bluish tinge you see here is a function of my camera, not the actual scan. 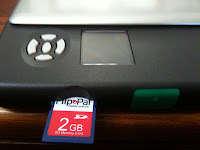 When I was done scanning, I popped out the Memory Stick from the Flip-Pal Scanner and inserted it into the USB Adaptor which I then plugged into a USB port on my computer. Immediately I saw a window on my computer which gave me options as to what I wanted to do. 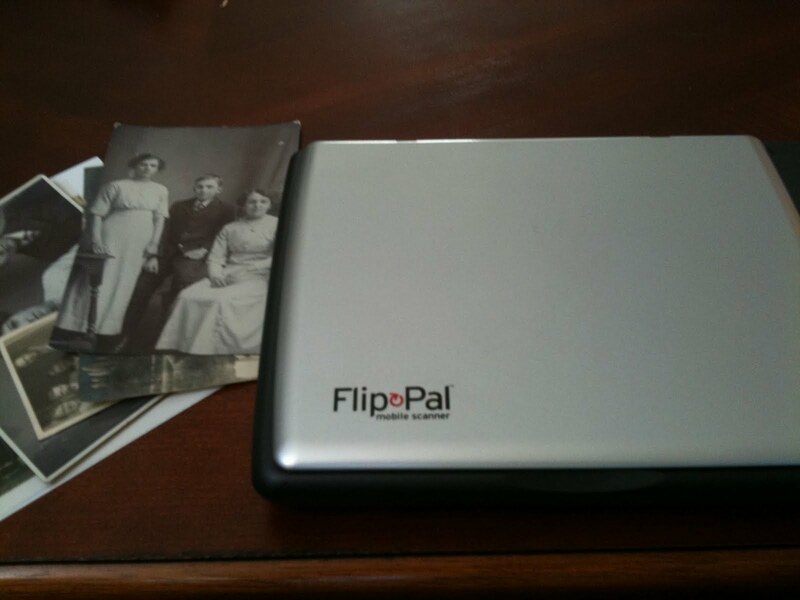 I chose to use the built-in program (Flip-Pal Toolbox) that was offered, and clicked on that. Lovely! A very easy to understand window popped up with various options including registering my scanner (for a full year's warranty). But first I chose the option BROWSE SCANS. They popped up just as items do in Windows Explore and I was able to quickly select all and move them to a folder on my C drive. Then I selected all again and deleted them from the Memory Stick. Just click on the graphic or this link if you wish to order your own scanner. The scans were of very good quality and I'm pleased with them. The photo on the left is my grandmother and two of her siblings in 1912. All in all I have only positive things to say about Flip-Pal Mobile Scanner . I'll be putting it to more tests as soon as I can get to my 87 year old Auntie's place. She has a ton of old family photos that I'm drooling over but she won't let them out of her sight! 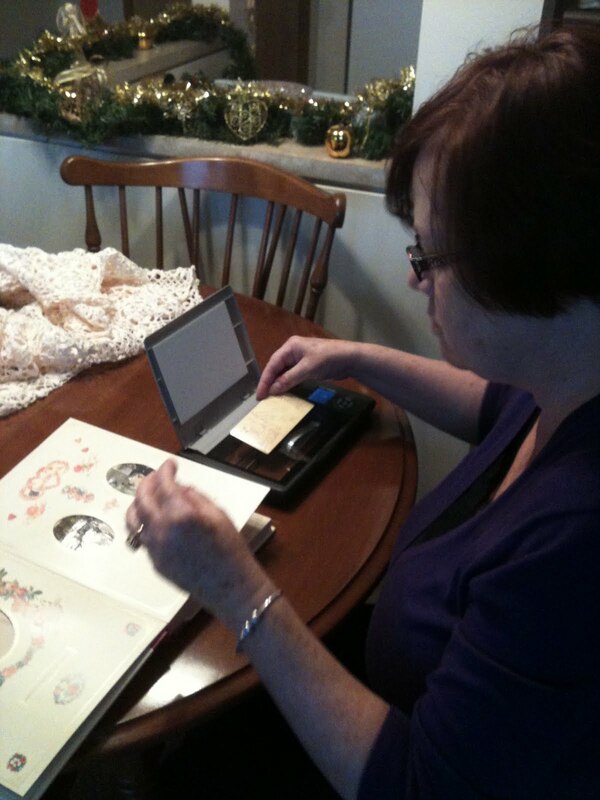 So now's my chance to visit and scan away without those precious photos ever leaving her apartment. Craig wrote to Olive Tree Genealogy about a WW2 American soldier's dog tag he has. Craig would like to send the dog tag home to the soldier's family. Can you help find T. H. Stull's descendants? Let's send this dog tag home! We've had success with other dog tags belonging to American soldiers, as well as two other miscellaneous lost and found family treasures. With the great team of sleuths reading this blog, I think we can do it again! American Soldier's Lost WW2 Dog Tags Going Home! MIA bracelet for Illinois soldier Vietnam War - can we find a descendant? 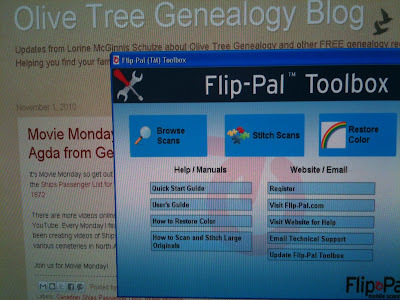 There are more videos online on the Olive Tree Genealogy channel on YouTube. Every Monday I feature Movie Monday with a new video. So far I've been creating videos of Ships Passenger Lists and Cemetery Walks through various cemeteries in North America. Join us for Movie Monday!